First of all, I’d like to wish all who celebrate it a Merry Christmas! With that being said, today’s card may not resonate with all of you. But it has been shown that the holidays can be a stressful time for some people. 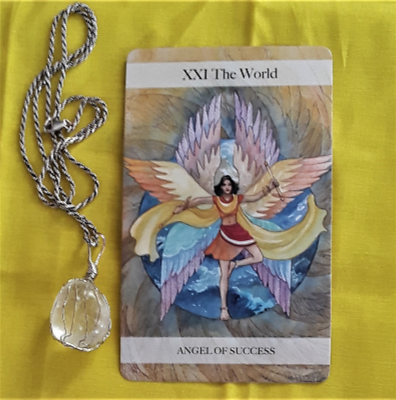 You may feel like there is a lot of pressure on you to make others happy, while at the same time not receiving much support for yourself. Some of you may be by yourself. Some of you may feel lonely in a house full of people around you. As I mentioned yesterday, I believe that the holidays are about connection. And if it is difficult to connect with others, then the feeling of loneliness may be the Universe’s way of helping us connect to ourselves. Alone time is an opportunity to align with our highest purpose. Whatever the case may be, it doesn’t have to be too heavy. Take it light. Ask others to help you if you feel overwhelmed. At the family dinner, you may not connect with someone on all levels. But if you have any common ground at all, that is enough to create even a small bond with another person. When it is all said and done, take pride in what you have accomplished, and know that others appreciated what you did (even if they didn’t express their thanks). If you are by yourself, do what makes you feel good. Pamper the parts of yourself that feel unloved by getting rest, entertaining yourself, eating comfort foods — don’t judge yourself. Go beneath the surface to find out what you need. Strengthen your connection to self. Then when the time is right, find ways to share yourself with other people. Wishing you much love and peace. Hello, everyone. The Tarot card of the day is the Five of Pentacles. 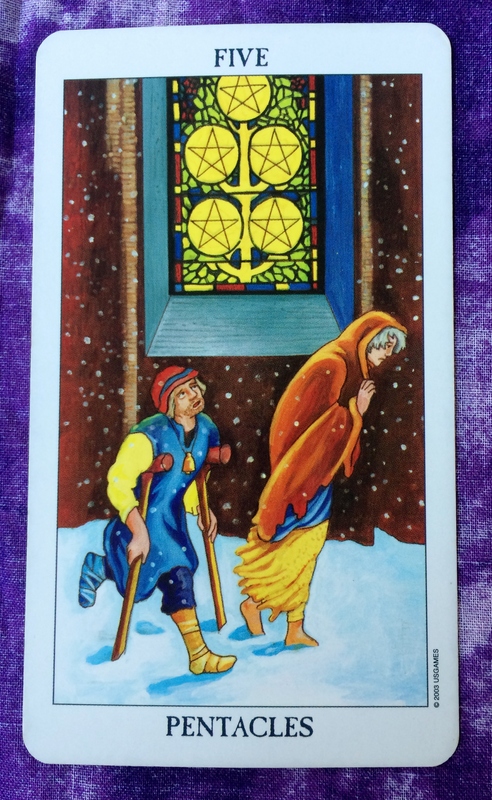 Like the card for this past weekend, the Five of Pentacles is showing that there may be more to our situation than meets the eye. As a whole, we all are dealing with challenges and difficulties. The key is to realize that you are not alone. You even may have people in your life who are willing to help you. Don’t hesitate to ask for help if you need it. Also, look around: The help you need may be right in front of you. 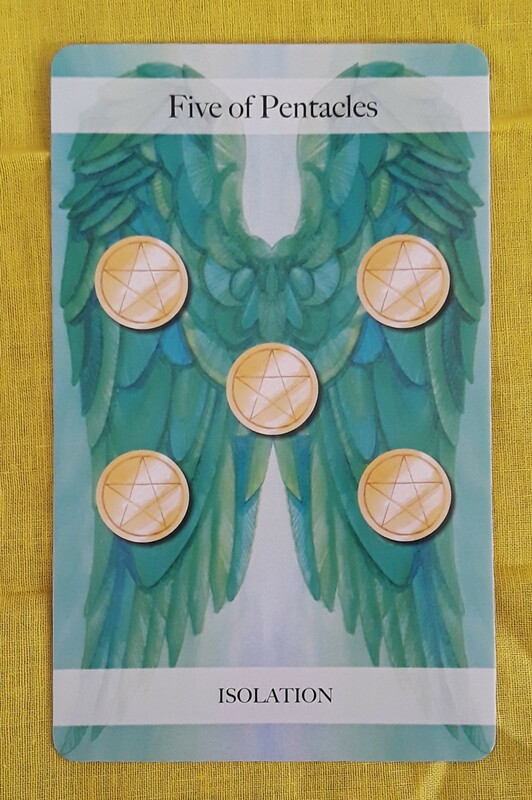 The card for today is the Five of Pentacles. You may feel discouraged. You believe that you have little to no resources. This could mean that money is tight right now but it does not have to be about money. You could feel as if no one has your back or that you are lacking the inspiration to see a way out of your situation. You feel alone with nowhere to turn. But are you really alone? Maybe you have friends or family members in a similar situation as you. These people can be resources for you, even if just as someone to talk to and who understands. Also, don’t forget that you can ask for help directly from people you know or institutions such as social services, heath care professionals, and religious clergy. Don’t isolate yourself. Pick your head up and look around for a way out you may have missed. Most of all, realize that this, too, shall pass. All of us have areas where we think we are lacking and that we all go through rough patches. You are not alone.